If there is one place in the world where it’s acceptable (and definitely fun as far as I’m concerned) to match every person in your family, it’s Walt Disney World. It is fun for photos but it’s also a great safety idea. If you all match, then it’s easy to keep an eye on the group in the crazy Walt Disney World crowds. We loved these t-shirts from Disney that were available in a variety of colors. You can pick up matching shirts at Disney World or even get customized matching shirts at the Disney Design-A-Tee shop at Downtown Disney Marketplace or online before you leave from the Disney Store. This is a great option for a family reunion. This year we’re all going to be sporting tie dye. 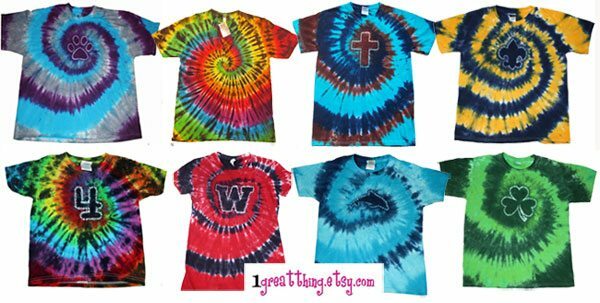 I’m sorry, but I can’t get enough tie dye and I’ve just become friends with Cassi over at 1 Great Thing on Etsy, who makes the MOST AMAZING tie dye shirts, dresses and even Toms shoes. Many styles even feature designs and shapes. She can do any color you’d like as well as special design requests. What could be better? Cassi is even offering WDW Hints readers free shipping until July 31, 2012 with the code: FREESHIPPING Go take a look!!! I think we’ll all wear matching blue tie dyes this year, but I’m still debating. Are you convinced? Have you and your family sported matching outfits on vacation? I love seeing families and groups wearing matching shirts. Honestly, I prefer the family things. We do it on every trip at least one day. It’s not always something customized, but just for fun we all try to have a matching shirt. One year we had a hard time finding matching shirts for everyone (children, ladies, and men) so each group matched. The kids wore matching shirts, the ladies wore a different shirt that matched, and the men did the same. It wasn’t the whole group, but it was still fun. We’ve never used the Design-A-Tee store, but are looking forward to trying in the future. I love Cassi and her tees! 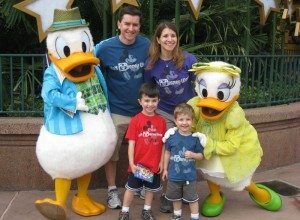 The only time my family has all matched was wearing her tie dye tees (we all had different colors, though) Typically, we match our shirts to what park we go to… Muppets or High School Musical for Hollywood Studios, Mickey/Minnie for Magic Kingdom, etc.